Our Vegetable Wellington is as delicious as it is beautiful. 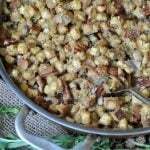 It makes an excellent main course for a holiday meal. This post was updated from several years ago. We thought you’d enjoy the update, which includes better pictures and an instructional video to show you how to roll up this fun and festive holiday main course. Are you still looking for something special to serve as the main course for your holiday dinner? I was too, until today, and now I can’t wait to make another gorgeous, and delicious, vegetable Wellington. Okay, I know, I waited until the last minute to decide on my holiday dinner, but that’s how I roll you guys. I work best under pressure. So this vegetable Wellington, you have to try it. If not for Thanksgiving, then for Christmas, New Year’s Eve, or New Year’s day, or any other day that calls for something special at your dinner table. 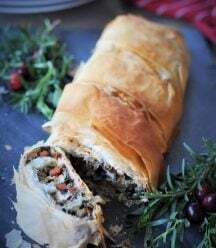 The veggie filling in this light and crispy vegan Wellington is incredibly healthy and savory, plus it will make your kitchen smell so inviting as you saute the leeks, celery, carrots, garlic, spinach, and herbs. What is it about the smell of celery cooking that makes me feel so warm and cozy? I really think that more doctors should subscribe cooking celery for anxiety, because the aroma has an amazing calming effect to it. What do you think, does celery do the same for you? Rolling the filling in the phyllo dough is also relaxing. So if you’re feeling tense because of the holidays, I recommend making a vegetable Wellington to calm your nerves and feed your soul. Are you ready to try this? 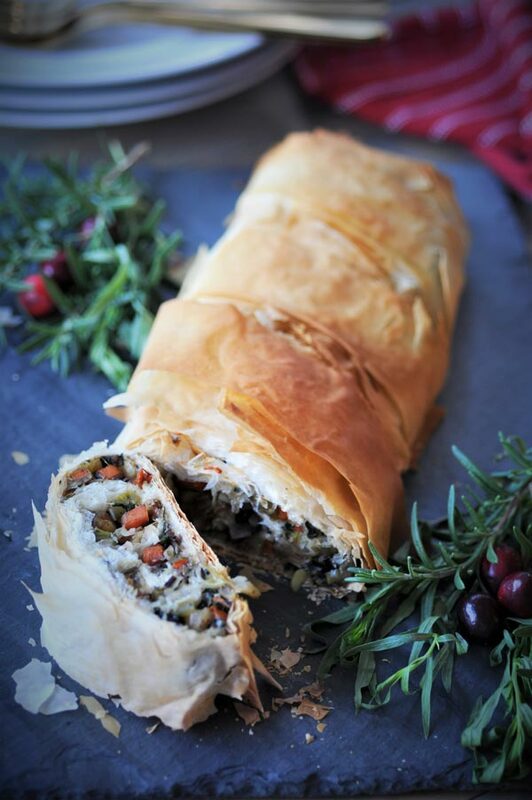 First – The first thing you’ll want to do is thaw the phyllo dough and then prep the vegetables. Second – Heat the olive oil in a large skillet. When the oil is sizzling, add the leeks, celery, and carrots and stir them around for several minutes. Can’t you just imagine how awesome this smells right now? Once the leeks, celery, and carrots begin to soften, add the garlic and dried herbs and cook for two minutes. Now, add some veggie broth to deglaze the pan, and add the fresh tarragon and spinach and cook until the spinach is just wilted. At this point your house will definitely smell like the holidays. 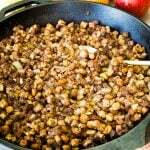 Add the toasted walnuts and stir to combine. Third – Begin building the Wellington. Be aware that phyllo dough tears easily. When that happens, just put it back together and keep going. It happens, don’t stress over it. 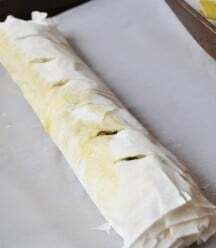 Stack two to 3 pieces of phyllo dough on top of a piece of parchment paper and gently brush the top layer with a thin layer of olive oil. Add a thin line of filling on the side of the dough lengthwise, leaving a two inch border. Roll the filling and set aside. Layer the two sheets of dough to make an extra-long sheet. 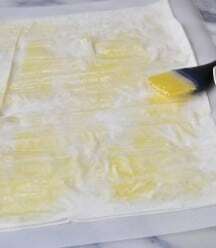 Brush with olive oil and add the large finished rolled dough on the edge and roll it up. Slice six vents on the top with a sharp knife. Place on the cookie sheet and bake for approximately twenty minutes, or until golden brown and puffy. So what do you think? It’s beautiful, isn’t it? Your friends and family will be so impressed with your cooking skills. They’ll also feel special because they’ll think you slaved away all day making this gorgeous vegetable Wellington just for them. Don’t tell them that it was easy and fun to make!! Let them think you’re a creative genius who didn’t mind making such a visually appealing dish for them to devour in less than five minutes. And that’s how long it will take before it’s gone, because it’s not only stunning, it’s delicious. 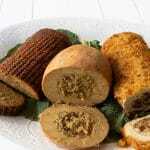 Check out the instructional video to see how to roll your Wellington. This is as delicious as it is beautiful. It makes an excellent main course for a holiday meal. Can I uße puff pastry instead of phi¬¬o dough? Can I make ahead and roll then bake? Hi Kristi! You can definitely make the filling ahead of time. Fill and roll it just before baking so the pastry doesn't get soggy. I made this last year for Thanksgiving as a non-meat alternative (I'm the only vegan). Everyone - and I mean literally everyone - loved it!! It was absolutely delicious!! I've been asked to make it again this year. Your recipes never fail!! Thank you! Thank you so much, Mary! This just made our week! 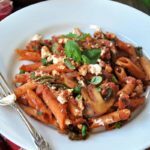 We love this recipe too, and are working on another version of it. Variety is the spice of life, right? :) We really appreciate your kind words and that you took the time to let us know how much you enjoy our recipes. Can I use olive oil in place of the avocado oil? Hi Kay! Yes, absolutely. Let us know how you like it. Thanks! Still a little confused on rolling all the layers. In the printed recipe format you say to use two layers in the second rolling and in the more detailed instruction you say to use three? 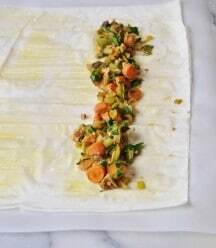 Once you finish all the rolling, should you have 4 or 5 layers of vegetables? Hope my question makes sense? Hi Kay! Use two sheets for each roll until you're left with two sheets, which is used to roll up the entire Wellington. Depending on the brand, there may be more or less to make five rolls, so try and eyeball what you have and go with that. The last roll should be two sheets of dough that are slightly overlapped to make an extra-long sheet. You'll use that to roll up the Wellington into one large roll. This gives the outer crust extra flakiness. Don't hesitate to ask more questions if you have them. That's what we're here for. :) We're thinking about making cooking videos for our more complicated recipes. Would that be something you'd be interested in? They're expensive to make (if they're done right) and we'd love your opinion. Thanks so much! Thank-you so much! A video would be a big help for me! 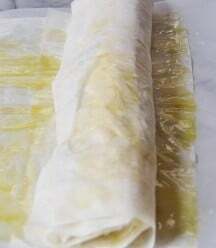 I have never used phyllo dough before and while I understand the first couple of rolls that you do, and the final wrap of the dough, I am not clear on how I am incorporating the rolls after the first two. Just in looking at the picture, it is hard for me to tell that there are that many rolls with the vegetables. It might all make sense once I start rolling, but just trying to picture it in my mind and the appearance of the final product, it is almost like there are two separate rolls, but I know there is not. Maybe I am making it harder than it is. Would I just add the three others rolls in line with the other like in picture 4, then roll it all up? But that does not seem to work either, sorry for being such a dunce. Ok, after reading this other method, I think I know where I have been confused. I was thinking there would be 5 different rows of vegetables, but is there really only two? Then after the two rows are rolled up, then I am just rolling the rest of the time with just the two sheets of dough at a time? Wow!!! That is exciting about the video!!! Thank-you so much!!! It is our first Thanksgiving as vegans, so I want to make something really special like the wellington! Still trying to decide what to serve with it, what do you like to have with it for sides? Thanks once again!!! Congrats! Our first Thanksgiving was nerve-wracking for me because I wanted our non-vegan family members to enjoy the food as much as we did. Our Cranberry Clementine Sauce, Garlic Mashed Potatoes with Gravy, and Stir-Fried Brussels Sprouts would be really good with this. Of course, pumpkin pie is a must. :) You can search the blog for all of these recipes. Alex made our Simple Pumpkin Pie for her friendsgiving celebration last weekend and her non-vegan friends loved it, especially the guys. Hi Jeri! The video is just above the recipe card. :) Thank you for making this, I hope you and your granddaughter love it as much as we do. Ahhh I was JUST talking to my mom about making a wellington for Thanksgiving. Thanks for the amazing recipe, I can't wait to try it! You're welcome, Jasmine! 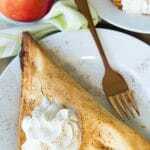 Always our pleasure to share recipes that our readers are looking for. Have a wonderful Thanksgiving! Awesome! Let us know what you think, and have a wonderful Thanksgiving. This looks perfect for the holidays! I need to find some GF/V phyllo! Thank you, Sarah! Alex said that she saw some at Whole Foods in the frozen section. I wish I knew the brand name. Sorry. Dang, your rolling skills are legit! LOL! 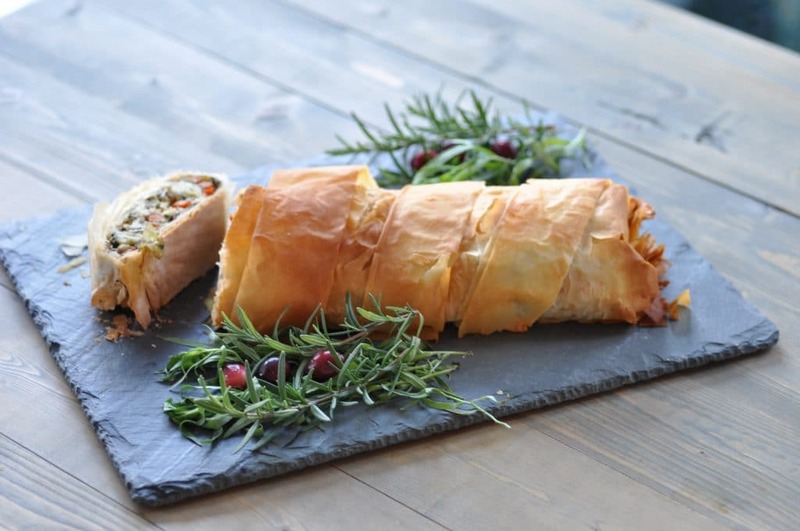 It sounds delish, but I'll shove anything rolled in phyllo into my face. this dish looks wonderful! That outside layer...would love to make this for thanksgiving! Thank you, Anjali! It makes such a beautiful presentation. Thank you Linda! Made this for Thanksgiving today. Turned out perfect. But i added chopped mushrooms to mine! Thank you, Lexey! We're so happy you liked it and that you put your own twist on it. Happy holidays! 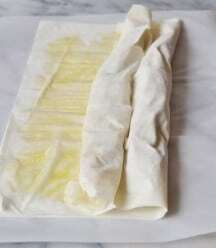 Where does one find phyllo dough that’s not made with butter? 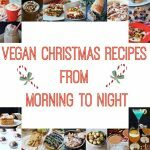 I would love to make this for Xmas, but i need vegan dough. Hi Sue, you can refrigerate it overnight and bake it the next day. Just make sure that you wrap it up tight so it doesn't dry out. Finally got around to making this for Easter. The ends on each side had little or no veggies, so they were a bit dry, wondering if there is any way to prevent that? Also, every time we cut it, was flaking all over the place, wondering if I brushed the top with olive oil, if it would help? Otherwise, my husband and I both really liked it a lot! This was absolutely one of the best mains I have made for a vegetarian holiday meal. I did add feta cheese to the mix. It was my first time working with phyllo and pretty comical. I was waiting for it to dry up before I had time to roll. Will definitely be making this at Christmas. Thank you so much! Hi Brigitte! Thank you. I think a sweet potato mash, a fresh salad, and roasted Brussels sprouts or sizzled green beans would be great with this. Have a very Merry Christmas!